Always sharp stuff from Vision. Good to see someone added it. Another classic. 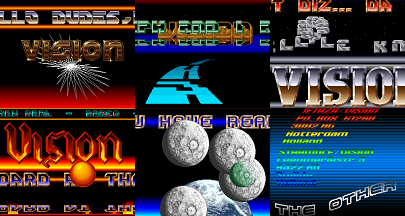 They were great at those landscape-filled fonts too. What Archmage said. Always loved this kind of fonts. Best of the 3 imho. big fonts, big sprites, colourfull parts, rulez! finally i come to Thumb this great piece! Hahaha good production.... Good old school. page created in 0.075491 seconds with 15 queries.